NSC228155 is an inhibitor of KIX-KID interaction that acts by enhancing tyrosine phosphorylation of EGFR. MOZ-IN-2 is an inhibitor of protein MOZ, a member of histone acetyltransferases, with an IC50 of 125 μM. Remodelin is a novel potent and selective inhibitor of the acetyl-transferase protein NAT10. Remodelin HBr salt is a novel potent and selective inhibitor of the acetyl-transferase protein NAT10. 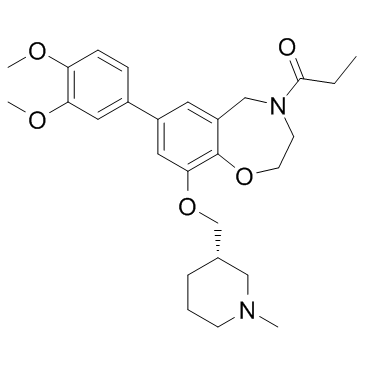 MOZ-IN-3 is an inhibitor of MOZ, a member of histone acetyltransferases, with an IC50 of 55 nM. PF-CBP1 hydrochloride is a highly selective inhibitor of the CREB binding protein bromodomain. Anacardic Acid, extracted from cashew nut shell liquid, is a histone acetyltransferase inhibitor, inhibits HAT activity of p300 and PCAF, with IC50s of ∼8.5 μM and ∼5 μM, respectively. I-CBP112 is a selective inhibitor of the bromodomain-containing transcription factors CREBBP (CBP) and EP300 (IC50 = 0.142 and 0.625 μM, respectively). 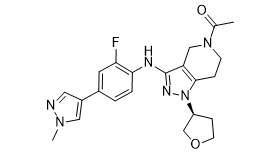 MG149 is a selective and potent Tip60 inhibitor with IC50 of 74 uM, similar potentcy for MOF(IC50= 47 uM); little potent for PCAF and p300(IC50 >200 uM). GNE-272 is a potent and selective in vivo probe for the bromodomains of CBP/EP300 with IC50 values of 0.02, 0.03 and 13 μM for CBP, EP300 and BRD4, respectively.